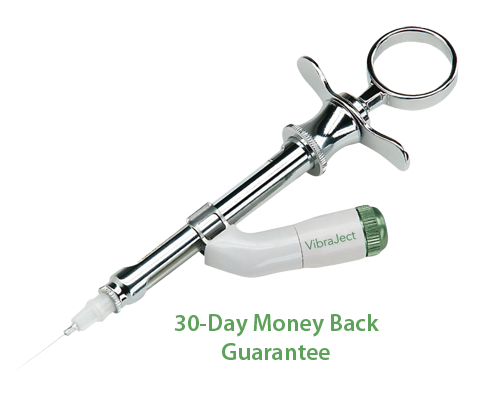 VibraJect is a simple and cost effective solution to alleviate injection discomfort. It works because the light pressure of a Vibraject injection is carried rapidly to the brain on thicker more insulated nerve tissues. By contrast, the needleprick travels on thinner nerve tissues, arriving too late for the brain to register the sensation. This conforms with the well established Gate Theory of Perception. Vibraject is good news for the patient, because the anaesthetic itself causes virtually no discomfort and good news for the dentist, who can work normally knowing the patient is comfortable. No disposable aspects (tips or hand pieces). No new techniques or procedures to learn. VibraJect® produces a mild vibrating sensation that helps over-ride the pain signals from the needle. The nerve endings associated with sensing temperature and pain are small, uninsulated and have a relatively low signal intensity. The nerves which respond to pressure and vibration are larger, insulated and have a relatively high signal intensity. When vibration and pain signals are combined, as in the case with an injection using VibraJect, it is believed that the “vibration” message carried by the insulated nerves predominates over the “pain” message carried by the smaller uninsulated nerves. The “tactile” pathway appears to have an inhibitory action on the “pain” pathway at the dorsal horn of the spinal cord. The patient only experiences vibration as proven by the Gate Theory of Perception. VibraJect® is a cost effective device that snaps right on to your existing syringe. VibraJect uses very simple and cost effective, proven technology to improve your injections whether giving intraligamentals, palatals or blocks. There are no new procedures to learn and no disposable aspects. Nobody likes injections, this we know. You’ve seen the range of emotions in your patients from mild uneasiness to absolute fear. Your patients will generally not tell you the fear or discomfort they experience relating to an injection as it is considered an acceptable aspect of the dentist. However, it is a fact many patients avoid seeing the dentist simply to avoid the “needle.” Regardless of how refined your injection technique is, the VibraJect is a unique and simple device that will eliminate your patient’s injection anxiety and discomfort, which will ultimately lead to happier patients, more frequent visits and increased referrals. You owe it to your patients to provide them ease of mind. Dr. Ara Nazarian ~ "As dentists, we all think our injec- tions do not hurt, or that we may not need such a device, but I can tell you from my experience that my patients do appreciate this system. I have personally experienced referrals from other patients that specifically ask for the vibrating needle. I highly recommend VibraJect for your practice"
Dr. Tim Kosinski ~ "I have to say, I was surprised at how well this simple little gadget clinically works - it actually works as advertised! I've purchased and used the Dental-Vibe, as well as the Wand system in the past, and I have to say the VibraJect is the most simple and effective solution for me clinically, as well as economically per patient. My patients and my staff love it." Scott Perkins, D.D.S. ~ "This gadget is no gimmick…When I give a painless shot, patients look up and tell me I’m the best dentist in the world." Don McNamara, D.D.S. ~ "The VibraJect is the #1 gizmo that I've purchased in my 30 years of practice. I honestly think that most dentists conclude that it is too good to be true. No topical, no adjustment of standard technique, no objections from patients and a good source for referrals, and NO PAIN." Henry Cohen B.D.S. ~ "I don’t like needles’ is probably the line we hear most… VibraJect provides a ‘wow’ factor in the practice and we have noticed an increase in patient referrals asking about the vibrating injection." Dr. Joseph Blaes ~ "Sounds like a lot of hype, right? Wrong! It really works…After the injection, many of my patients ask when I am going to give them the ‘shot,’ not realizing I already have." The Needle Phobia Information Center (NCIP) ~ "Many needle-phobes will tell you that they fear the pain of needle injections more than dental procedure pain. The manufacturer’s claim that it is as good as anesthesia paste holds true."